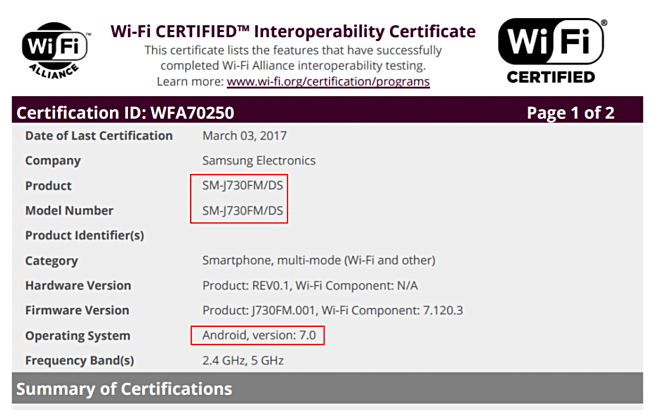 The Samsung Galaxy J7 (2017) - which has already received Bluetooth certification and also cleared the FCC - has now received WiFi certification from the WiFi Alliance (WFA). The listing reveals the device is powered by Android Nougat. As for other specs, from what has been rumored so far, the handset is powered by Snapdragon 625 chipset and sports a a 5.5-inch Super AMOLED display of 720p resolution. It has 2GB RAM, and features 8MP/5MP camera combo. Enough of bickering by Sammy, all passed specs are damaged fooled, costing nearly 500$.Nonsense HTC, LG, and Chinese brands much better. No resale. Care to expatiate on the unsavory relationship between AMOLED display and SD 625..
Well for Pentile Amoled's display size should be 1/3rd less than LCD's to achieve real 320 PPI so even FHD 5.5Â“ one should be sub pair.